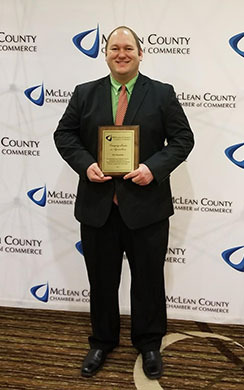 Eric Vanasadale, GHSC member, received the Emerging Leader in Agriculture from the McLean County Chamber of Commerce at their annual Agriculture awards banquet February 23, 2018. Eric was nominated by Heartland Community College for his efforts in helping to educate the community on safe and legal use of unmanned aircraft (drones). An interesting tidbit we learned from Eric recently was to check with your current insurance provider to learn how they handle insuring drones. Some include personal use of drones in their standard policies, and some require a separate policy for drones used for commercial purposes.